The ability to obtain information from different interconnections (and interpretations) of data is a hot topic: the so-called issue of analytics and (especially) the consequent possibility of exploiting this information to build predictive models. Sometimes, however, these possibilities are a concept or are applied to macro contexts (traffic, weather, macro behavioral algorithms …) rather than micro-contexts. Much can be done but also in the so-called “micro” and in industries other than those typically involved such as the retail and transportation: for example in the social field. In the Secure Living Project (Abitare Sicuri) project, deployed in the City of Bolzano, me and my team faced the need to check the well being status of people (disabled or elderly) who in the prime of their autonomy and independence in their home might have a need for aid. This need is heightened, increasingly, by their social status (no relatives, no continuous contact points). The record speaks, for example, dozens of cases where people in this social context have suffered serious consequences (up to the loss of life) from a trivial domestic incident as a fall: simply because no one had bothered to check whether the person was feeling ” good” or simply was “present.” Being present and feeling good are two different sizes, related to, but with a different scope and time because they can practice for prospective to the present or future. In our solution, we were able to understand both. The amount of personal data collected on ordinary citizens has grown steadily over the decades, and after 9/11, corporations that had been amassing this information largely for marketing purposes saw an opportunity to strengthen their ties with the government. Paradoxically on the medical point of view, “when it comes to lengthen the life span, many of us are more than willing to do something concrete. So it is quite probable to start, even on its own, to transfer personal information from a sensor to experts trained by the Numerati. But in the coming years, it must be said, anyone who offers services such forecasts will probably be a charlatan, because the behavior patterns of many diseases have not yet been defined. But once that research will have collected one or two decades of data, the onset of the disease can be identified in time (hopefully) to be nipped in the bud. The ability to predict disease undoubtedly will raise many issues of social and economic. But the debate is still open because research is at an embryonic stage.”* What is decisive is therefore collecting data to build models of behavior. It must be said that one thing is to collect a series of biological information and the other a set of attitudes that provide the indicators to establish a first layer of information directed more to care than to cure. The study of macro behaviors (i.e. getting up, walking, eating, etc. ), in fact, allows us to understand that behavior if it undergoes a change from the standard and then foresee a situation that for the moment we can only be described as “abnormal.” And ‘in this context that mathematics plays a crucial role. On the one hand to maximize the information collected (which are not as punctual as a value out of the blood normally, but are faceted as related to human behavior) on the other hand to construct other scenarios in which “experts” will have to make decisions. In fact, doctors are too busy and the devices themselves are of little use. “The Numerati” as he calls them Stephen Baker, “will have to read the patterns of movement, language and social interaction, to interpret their meaning. Only mathematics is able to follow these streams of data almost meaningless and then provide a stream of information for medical or social warnings specific applications”*. To make you understand the complexity of the scenario is worth mentioning again Baker: “even the simplest algorithm should be adapted to the individual case. For some disabled people to be out of their bed can be an alarm signal. For a healthy person who does not get out of bed, on the contrary, it can be a problem”*. The example of the bed is not random. Many studies, for example, identify sleep as a “behavioral frame”. All we sleep at some point in our day and so the bedroom and in particular the bed can be one of the sites of investigation. There are projects (and sensors) to verify the presence in bed. But the information is limited and limiting. I’m in bed, but am I sleeping? Reading? Doing what? I do not get up: Am I sick? Or do I just want to stay in bed? As well as in laboratories of Intel in Portland, Oregon where the team of Eric Dishman is experiencing a series of sensors, called “magic carpet”, drowned in the floor of the laboratory that can test the risk of falls, determine the weight of a person, but of course the mere presence, and ideally do it in a kitchen. A fascinating project, and full of ideas, in a precise direction of research. But together we need to research contemporary. Because reality is now, the need of care is already a must as the need for collecting data behavior. We, too, in Bolzano, identified the kitchen as the hub-stage of our project, because we believe the kitchen is the place where it enacts one of the most significant human behaviour, richer of meanings than the sleep : nutrition. In the kitchen we installed our sensors to verify the presence of behavioral patterns and then photographs the status of expected behaviors, as “master” behavior, in order to use it as a reference. Unlike the magic carpet we chose a less invasive, more close to “reality” – and in the very short time – more effective approach. In fact, beyond the simple human presence was essential for us to understand whether a person was interacting with the stove and then was having to deal in some way with the food. Our current research project was not conducted in a laboratory, but in the homes of 30 people, taking account of the real life, of the status of the architecure (and housing) of flats like millions of other flats all over the world, the needs of real people and the budget of the “care machine” (public or private). In fact it is unthinkable to propose large-scale models involving invasive interventions on the grounds of both the cost (design, installation, maintenance), both for the inconvenience, both for the time that this entails. The traditional warning systems are typically based on a system of transmission (automatic or autonomous for example) where the person has to activate the alarm or are sensors that will communicate an event (i.e. non-standard values). But while the self-activation of the alarm is often impossible (the typical case study talks about the the transmitter is forgotten or not worn) on the other type of warning systems like sensors (most likely) is that no exceptional event occurred to trigger an alarm. Is it possible then to build a model of care and assistance on this basis? Rising CO value allows us to establish that the person is is alive and responsive because he/she is making an action. The time at which this occurs is almost constant throughout the monitoring period and therefore allow us to build a stream of alert in case of anomalies. Take the case, for example, that our subject has a routine of conduct (which, as mentioned, very common) involving 4 repated appointments such as breakfast, lunch, snack, dinner at almost fixed times: let’s say at 9, 12, 16, 19. If the system detects that the CO level does not rise at 9 (or in the range of + / -15 minutes) the system can monitor the later check points (lunch, snack or dinner) with a level of pre-alert, a “particularly close eye” on that situation. At the same time, other vital parameters (monitored throughout the project, as the level of CO2) can be extracted automatically and kept under the magnifying lens and cross so as to define in more detail the scenario. This allows the staff in charge of social services, (but also the relatives) immediately or within the day to keep on screening information and allow the necessary actions. The regularity of meals is one of the main ways to monitor the health and well-being of a person. Besides the fact that regular eating habits are more beneficial to your health than irregular (or chaotic) eating habits – all other things being wellness equal**. The check for regular meals we can provide a wealth of information on both the current state of health and pote prevent the onset of some physical and psychological disorders. Positioning the sensor in the kitchens, not only allowed us to have a crucial fact where the risk of generation of CO is the highest, but of course also showed that rising levels of CO corresponds to the performance of activities and then to the fact that a person is willing to prepare a meal. Whether it’s a meal or, for example, boiling water for washing, it is not possible to know, or rather, can be achieved in two ways. Requested directly to people (but it would take a long time) or by deducting the information on a large scale analysis of the data. And here is where, once again, mathematics can helps us. How? With the odds. If you try to write “Kitchen” into Google you get 1.620.000.000 web pages. If you add to kitchen “cooking” the pages become 363.000.000. If you add the word “fire” you get 29.600.000 pages. And so it is possible to deduce a conditional model indicating numbers of related events. 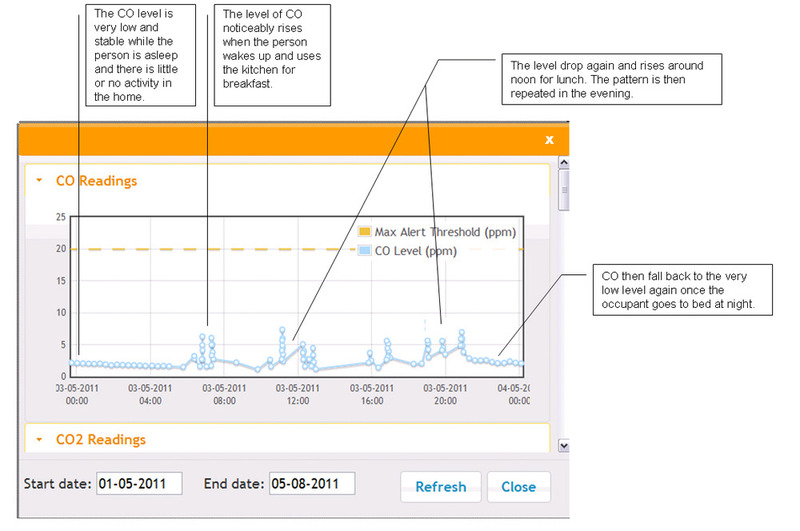 As you add the information from a sensor the system adapts and refines the results. It ‘a process of self-defined statistical learning known as “bootstrapping”, or the ability to develop himself as Matthai Philipose well explains. The data item, in fact, may have a relative importance, but when combined in a time frame and compared with sequences and series, allows us to draw a person’s behavioral real trajectory, indicating if and when the routines are not repeated regularly and then suggesting to the supervisors – in case of anomalies and no repetitions – the need to investigate possible causes. This information is very effective if cross and shared with the normal activity of a person (doctor visits, physical activities, etc.). The advantages are obvious compared to other systems of monitoring and care, and outcomes are based on real experience. The devices are “transparent”, are hidden in the home (it may be enough to have only one sensor in the kitchen), should not be worn, remember, reloaded, activated. In our project we have developed a “plug and play” logic where we could only have need of electricity (and in some cases not even that, working with battery-powered sensors). We solved the transmission of data interconnecting the devices (when necessary) through a zigbee meshnetwork, concentrated in a single node connected via 3G for crucial savings in terms of cost and time. Because the reality is that older people do not have a wifi network or an DSL at home. It ‘s clear that the association with the clinical data allows a person to develop more clinically interesting scenarios, but the system can just agnostically highlight a chronic or puncutal anomaly. It is also true that the choice to install such systems arises from the need of the subject or family in accordance with the subject itself: it is therefore an explicit monitoring. The costs of purchase, installation and maintenance of these sensors are very low. The cost is rather part of an overall picture of the monitoring system, transmission and data management, in the mechanisms of action and especially in the post-warning strategy for social care, but this is not the place for such a study. The figure has a dual function: information in a timely manner on a specific parameter, but when combined with other information gives us a much richer information framework. A system of this type does the double duty of providing a timely warning and allow early detection actions which decisively reduce the cost of “ex-post” intervention of the whole apparatus. Knowing the behavior of people is very important, it not only serves the retail industry or the banks to suggest to buy some new products and anticipate our needs with the goal of making us consume (and spend) more. Knowing the behaviors and habits can save a life. Unfortunately, the demonization that comes from the obsession with which the industry tries to “observe” and thus to the rejection a priori of all that has to do with the “monitoring” means that sometimes you lose sight of reality , the possibilities related to it, the ultimate goal. I believe that our research is a first important step to start a process of customs clearance of some typical associations (monitor = control) and place them semantically in another context (monitoring = prevention). Secondly, it represents a real project in the field, with problems, situations, data and real people and then acts as a field of advanced but contemporary research. Thirdly suggests how the data may have very different facets and open scenarios into context with respect to the underlying assumptions. Finally, last but not least, addresses the crucial issue of an aging population (which can be simplistically summarized as follows: more people who will live longer in a state of better health, with opportunities for social interaction than ever before, at a time of economic downturn and budget constraints of the families and the public administration) and respect for their dignity as persons. Just as the UK Department of Health has noted, telecare is “as much about the philosophy of dignity and independence as it is about equipment and services”. And if there is anything we need is to harness the power of technology to help even the weakest, and is an area yet to be discovered. ← Smarter traffic? Some possible solutions are already there since 1990 (they are called RFID).